Prefense is a revolutionary new hand sanitizer that protects you from germs with just one application per day. The patented, alcohol free formula soothes and moisturizes hands while providing up to 24-hour protection. 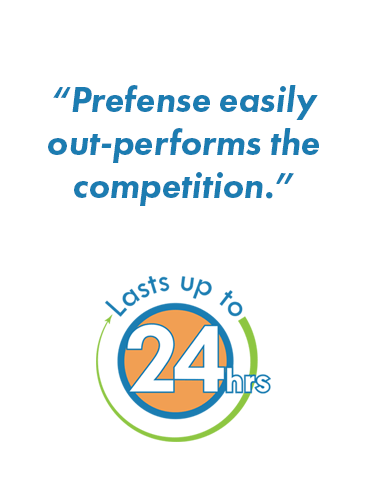 When compared to other hand sanitizers, Prefense easily out-performs the competition. Prefense lasts up to 24 hours, while other formulas lose their effectiveness in seconds. The active ingredients in Prefense safely bond with your skin, and protect you from pathogens all day long. Prefense is made from a patented, silica based formula that moisturizes skin instead of drying it out. Additionally, the no-mess Prefense foam is safe for the whole family.